Let’s think SPRING, shall we? I don’t know about you, but I’ve had about enough of Winter. It’s time for disappearing snow, no ice, warm days, gentle breezes, birds pairing off and building nests, buds swelling on trees and flowering hedges, early flowers pushing through … oh my … yes! I want all that! How about you? Usually Winter doesn’t get to me anymore, although I don’t like being cold; I can tolerate the season and enjoy its unique intense beauty, but this year it’s been pulling me down and sitting on me. And it’s been so constantly cold, way too snowy and icy, that I am just plain ready for Spring! Depression has weighed on me for many months; not so much that I can’t function at all, but enough that I have been low on energy and finding it hard to get and stay interested in anything. I would like to crawl into bed and stay there for … I don’t care how long. Apparently, I have a real thing … a low-grade depression that is enough to keep me in this lacklustre state of mental weariness where I’m wanting to do but lack motivation and energy to accomplish much at all. It’s exasperating, disappointing, and exhausting. I’ve lost my joie de vivre and I’m tired of being tired! As a result of all that, just one thing that has suffered is my blog — for which I have felt twinges of guilt — and my reading and writing have been making next-to-no progress. I do apologize to you again, my dear reader, for not keeping up with posting here. I hope you will forgive my lack of enthusiasm and commitment and not quit on me. We had a break in our weather for a few days, but now we are in the beginnings of the receiving end of a few more centimeters of snow. Do we need more? I THINK NOT! 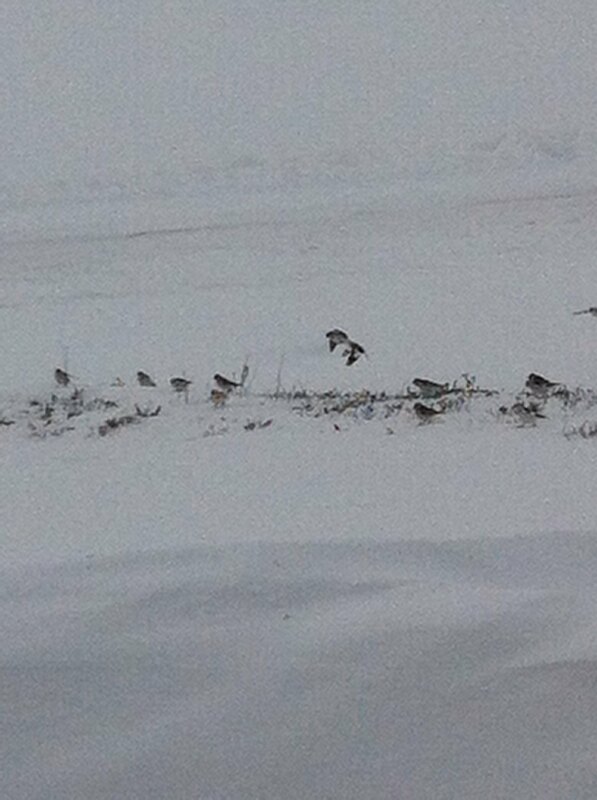 This is a flurry of snow buntings, the whitest of winter birds. Do you know what they are sitting on? MY HEDGE! Yes, my hedge is under all that snow. I really am not pleased to see more snow coming down, even though it is pretty. Enough is enough, thank you. To look ahead a little, today I have this link to share with you that I think will remind us all of the season we long to celebrate. (Or I do, anyway.) Maybe it will give you some new ideas for your gardens. Click on the red words here to see a list of flower names from A to Z. There are no images with the flower names, so we have to “Google” them to see what they look like or search in gardening books. I hope you enjoy the list, anyway. How have you been surviving Winter? Do you have favourite flowers you can hardly wait to enjoy?